The superstar DJ rocked the Jingle Bell Ball 2012 at London's O2 Arena. See the pictures of Calvin Harris featuring Tinie Tempah on stage here. 1. 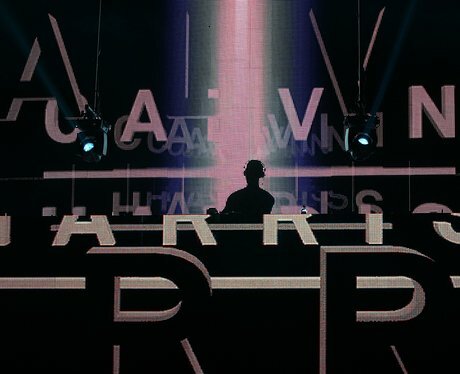 Calvin Harris opens his set at the Jingle Bell Ball 2012 with massive track 'Bounce'. 2. Calvin Harris takes to the decks performing 'Bounce' live on the O2 Arena stage. 3. Calvin Harris shares a moment with the 16,000 fans in the audience while performing. 4. Example joined Calvin Harris on stage to perform their hit single, 'We'll Be Coming Back'. 5. The crowd enjoy the giant inflatable balls let loose in the O2 Arena during the track 'Bounce'. 6. Example kicks an inflatable ball on stage during his duet with DJ Calvin Harris. 7. Calvin Harris is lit up in green lighting as he controls his decks on stage. 8. Calvin Harris's DJ decks are lit up as he performs 'Feel So Close'.